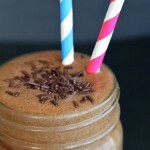 I am SO RIDICULOUSLY EXCITED to share this recipe with you guys!!! So ridiculously excited. And, yes… this is one of those times where caps and multiple exclamation points are 100% necessary. As is spellcheck, apparently, since I can’t seem to spell ‘necessary’ when I get really excited. Nailed it that second time, though… aaaaaaand then managed to misspell ‘second’ in a way that made spellcheck think I meant ‘seance.’ Oops. Fingers not keeping up to brain. Anyways! I’m rambling… which is kind of what happens when I get excited. Or nervous. Or hyper. Or tired. Or… any emotion that sits at either end of the spectrum. But today? Today we’re excited. And also slightly hyper, so bear with us. So I’m going through a bit of an ABJ phase at the moment, and by that I mean I’ve been eating that combo for lunch more often than I care to admit (read: basically every day). What can I say? 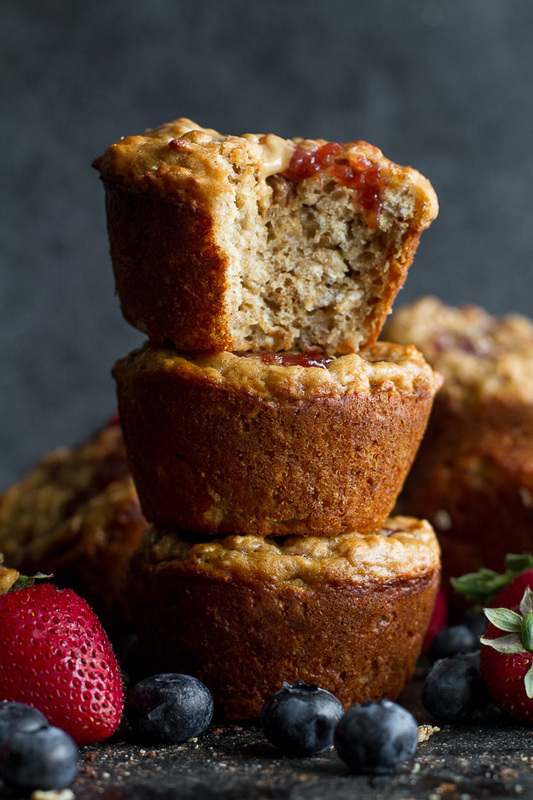 You guys know I love my sweet lunches, and these muffins are healthy enough to eat as part of a meal if you do so desire. 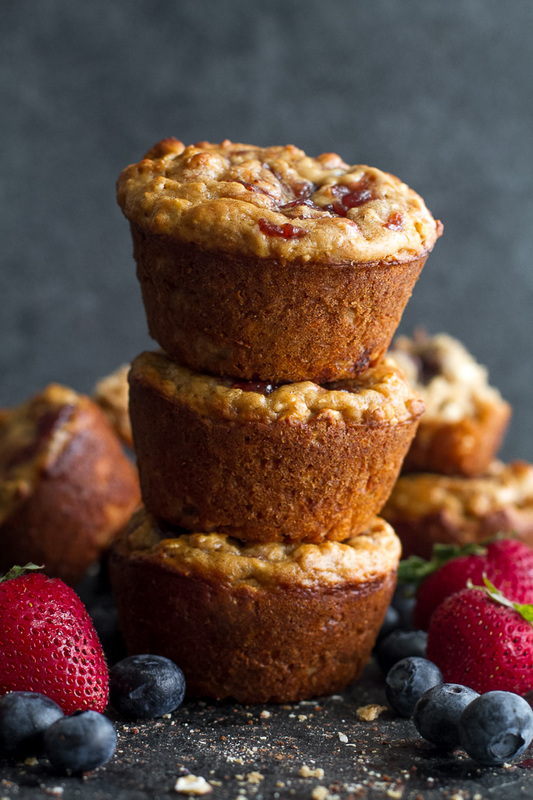 You can also swap out the almond butter with peanut butter if you want to make peanut butter and jelly oatmeal muffins, buuuuuut long-term readers will know that this girl doesn’t swing that way. Unfortunately. I would if I could! Especially because my food blogger brain imagines it would be a whole lot better for SEO. Oh, and if you’re dealing with nut allergies or want to make these nut-free so that your kids can safely take them to school, just swap out the almond butter for some roasted soy nut butter (I like the Wowbutter brand). I can’t speak to this statement personally, but apparently it’s supposed to taste pretty similar to peanut butter. And it’s 100% safe for schools and those dealing with nut allergies, so thumbs up for that. Like a lot of my other muffins, these ones are made with one of my favourite baking substitutions – Greek yogurt. This stuff is pretty magical because it helps make muffins soft and tender while keeping them oil-free. I like to use 2% because I’ve found that adds a touch of extra moisture compared to 0%, but it’s not that big of a deal and you can really use whichever you prefer. For the jelly, I made half the batch with blueberry jam and the other half with strawberry, but again… use whichever is your favourite. And use as much of it as you want! I gave a general guideline for how much ABJ to put on each muffin, but feel free to add more if you want a more intense ABJ (or PBJ) flavour. I hope you love ’em! In a large mixing bowl, combine the flour, oats, cinnamon, baking powder, and baking soda. Set aside. In a separate bowl, lightly beat the egg a few times until the yolk breaks. Whisk in the yogurt, honey, sugar, and vanilla. Add the wet ingredients to the dry ingredients, mixing gently until just combined. Divide the batter evenly among the 12 muffin cups, filling them almost to the top. 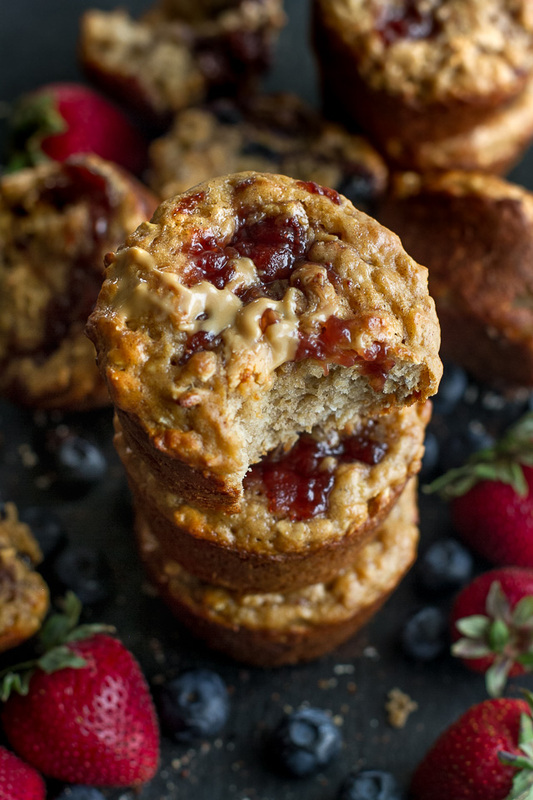 Top each muffin with 1/2 tsp of jam and 1/4 tsp of almond butter, and use a toothpick to swirl them around. Try not to bring the jam too close to the edge, or it'll melt and burn on the side of the pan. Bake for 17-19 minutes, or until the tops of the muffins begin to turn golden brown and a toothpick inserted into the centre comes out clean. Allow the muffins to cool in the pan for ~15 minutes before transferring them to a wire rack to cool completely. Store them in an airtight container at room temperature for up to 5 days, or freeze for up to 3 months. * You can also use all purpose flour or a mix of 1/2 cup (60 g) all purpose and 1/2 cup (60 g) of whole wheat flour. ** You can also use regular brown sugar. 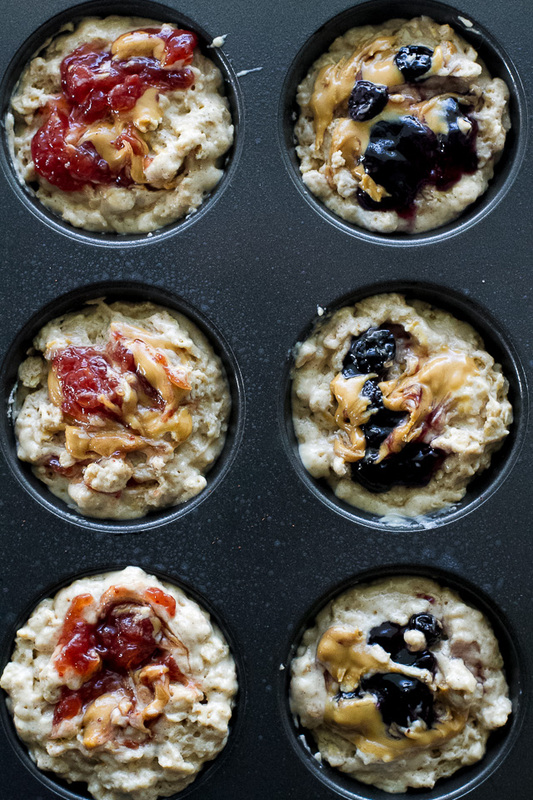 Looking for more healthy oatmeal muffin recipes? Try one of these! Omg I’ve been on an AB&J kick lately too! I’m a huuuuge fan of the Wegmans brand Triple Fruit spread; it’s the best because I can never decide so you get three in one! 🙂 Muffins for lunch are always a good idea, but I’m craving a big ‘ol salad today. Can’t wait to make these, Amanda! I don’t think we have Wwegmans up here, but I do love those berry blends! I hope you like them if you make them, Marina. I could always eat muffins for any meal, especially if they are in the form of my favorite sandwich! These muffins look spectacular as all of you muffins do 🙂 As for jelly, my favorite flavor has to be strawberry! Definitely a solid choice! I’d say strawberry is #2 for me, but that’s mostly because blueberry has nostalgic value. Twins today 😉 Love your swirls – I’m telling you – you are a genius at swirling things into baked goods lol! Will GF flour work instead of whole wheat flour? I’m celiac. Me to Nietta. I hope to make these tomorrow using GF flour and baking powder and x gum to hang them together. Will report in. Thanks so much for chiming in, Dianne! I’m hoping to start experimenting with more GF muffins in the future, but if you do end up making them, I’d love to know who they came out. THESE look so good. They definitely deserved lots of exclamation points, but I think most of your recipes deserve exclamation points. 🙂 I love any nut butter & jelly combo. My fiancé would go totally nuts over these! He loves anything peanut butter and jelly related, add in a baked good element and he will just lose it. I may have to surprise him with a batch! 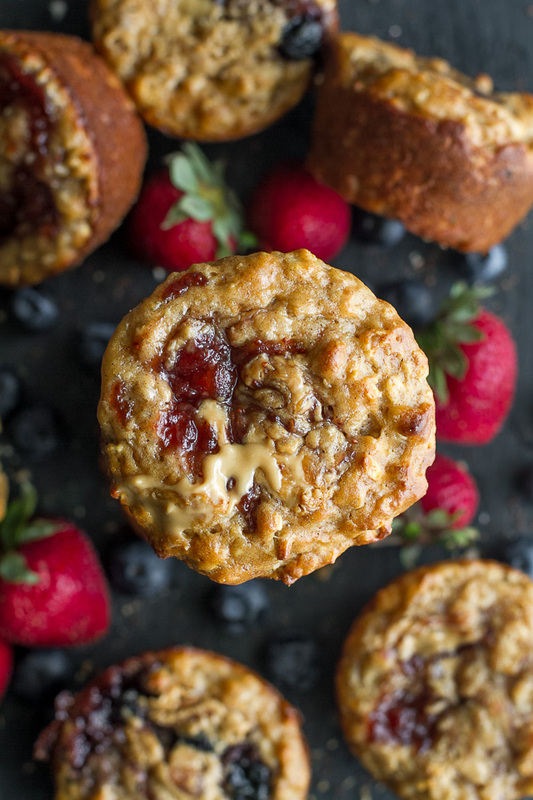 I totally made a paleo version of PB&J muffins [obviously they were almond butter & jelly] and they were amazing!! Of course mine don’t look nearly as beautiful as yours do though. 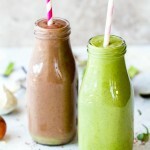 Your food styling and photos never cease to amaze me! And can we just talk about the goo factor these appear to have? I’m all about that!! Wow these sound good. I haven’t had a pbj sandwich in too long. I need to fix that asap! Amanda, even for somebody who does not have a particular sweet tooth – I could happily eat one or even two 🙂 of these. They look sooooo delicious. They’re not -overly- sweet, Carina, especially if you go easy on the jelly. I think you’d like them! Yum!! I love me some classic grape jelly with peanut butter! Tried and true! You now… I don’t think I’ve ever had grape jelly. Is that crazy? I definitely just printed this out. I’ll have to make a couple substitutions based on what I have (I only keep one kind of flour in the house since I basically never use it), but these will make amazing snacks for the rest of the week! I hope you looooooove them, Kelly! Lemme know! I didn’t have any while I was growing up (allergies 🙁 ) so I’m making up for lost time now! I’m so hungry right now. I want 5 of these. Almond butter and jelly is a magical combination. And I love muffins, so I will definitely be tryin these in my near future. Especially because I just got some new nut butter in the mail! I have to make these. I am obsessed with PB&J sandwiches (I seriously still have one everyday for lunch). You and me both 🙂 I hope you like them, Emma! Wow wow wow these look nice. 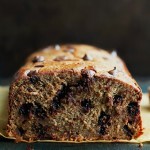 It is almost lunch time and I am way too hungry to look at muffin recipes. 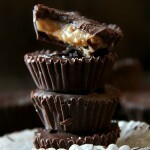 I need to make these asap! I may be slightly biased, but I definitely think you do. I hope you like them, Megan! Muffins make me happy, especially when they’re healthier so I can eat them in multiples with a slab of butter. I love how these pictures came out. The strawberries look so plump and the muffins look magically delicious. These look and sound amazing!! 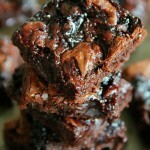 Definitely adding these to my pinterest and making them soon! I hope you like them, Melissa! 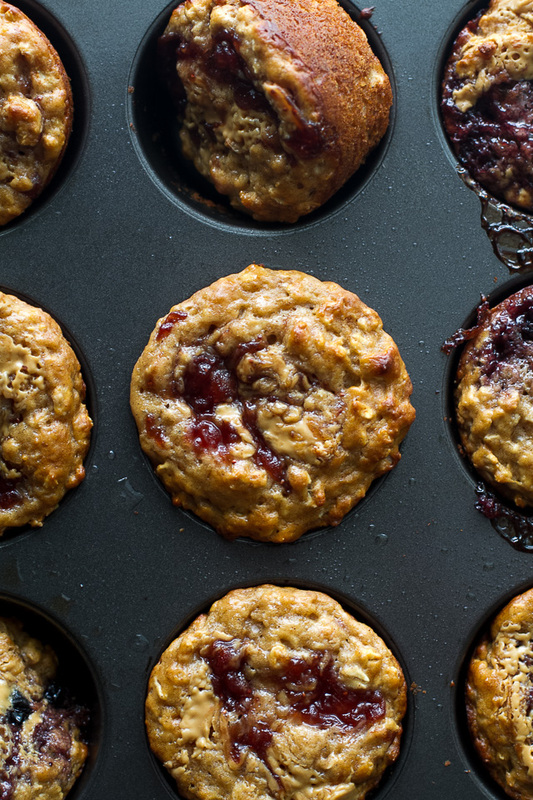 Love this muffin that takes the flavors of a childhood classic favorite! Maybe I can make a gluten free version. I’m curious if anyone tried these with almond flour? I know it bakes differently than regular flour, but just wondering before I attempt it myself:) They look delicious! Made these today, came out pretty well! I used peanut butter and peach jelly. These muffins aren’t too sweet, but I look forward to enjoying them for a healthy grab and go breakfast!